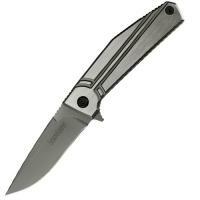 Kershaw's 4030TIKVT Nura 3.0 folding knife is more than just a well-designed blade. Artistry paired with superior craftsmanship makes the Kershaw brand a renowned leader within the industry. The well-crafted Nura tactical knife is derived from master craftsman Dmitry Sinkevich. Nura's 3 inch blade is crafted of premium stainless steel and coated with a titanium carbon-nitride coat for added strength, heat resistance and corrosion resistance. Its sleek, grooved handle is forged of 410 titanium sanded to create a reflective surface. Easily access the blade utilizing Kershaw's innovative KVT ball-bearing opening system and durable frame lock. Pull the flipper to deploy the blade with ease. The addition of the single-position pocket clip accommodates convenient carry.